We can no longer use the excuse that it is difficult to install broadband across Shropshire because we are a rural county. Most rural areas are doing much better than we are. It is the failure of Shropshire Council to invest in broadband that lies at the heart of the problem. A few weeks back, Patrick Cosgrove, Shropshire’s indomitable broadband campaigner, circulated some interesting data in his newsletter. I’ve drawn up a graph of the data and it is quite a shocker. Only 24 out of 321 local authorities (7%) have worse fibre broadband coverage than Shropshire. Why is our performance in rolling out broadband so dismal? Is it because Shropshire is remote and our villages hard to access? I don’t believe that for one minute. Comparable counties have been doing much better. The government classifies Shropshire as a “largely rural” area. Only five of the 40 largely rural areas in England have a worse record of broadband rollout than Shropshire. If we compare Shropshire with the ten most similar counties, only three perform worse than us on fibre broadband rollout. Whichever way it is looked at, Shropshire is performing badly on delivering broadband across the county. If we were ahead in broadband, we would be ahead in business. Being ahead in business really matters. People in rural areas need jobs and they need well-paid jobs. We have seen almost no growth in the number of businesses in Shropshire since 2009. This compares to a growth of 9% across England. We’d have another 1,300 businesses in the county if we’d matched the 1.1% growth seen since 2009 in the ten counties most similar to us. If we have flourishing businesses in our rural areas, the council will draw in more business rates that we can use to support business, communities and wellbeing. What disappoints me is the lack of ambition within Shropshire Council about what can be achieved. We are always told that things are difficult to do in Shropshire because we are rural. Being rural is a challenge but it is a challenge that this council was elected to rise to. It should not making excuses and must invest in the future of our county. Broadband, including superfast broadband, is essential. And it’s not just for business. More and more broadband the way that we hear news, deliver education and health services, do our shopping, and keep in touch with our friends and family. Broadband is an entertainment medium too. Why should people not be able to stream a movie or a sports match just because they live in Shropshire? In a rural area like ours, where services are often difficult to access because of their distance and a lack of public transport, I think we need broadband more than urban areas. Shropshire Council should set itself the challenge of keeping up with government national targets. It may well need to borrow money to do so. That’s what businesses across Shropshire and the country do. They borrow to invest and there can no better investment right now than broadband infrastructure. Floreat Salopia with broadband please.
. The data being discussed here relate only to standard broadband, delivering a minimum of 2Mbs. When it comes to superfast broadband, 24Mbs and above, Shropshire has a 68.7% rollout. Only 20 of the 321 local authorities in England perform worse than us on superfast performance.
. More precisely, our local authority area is 75% rural. For those that like lists, we are the 53rd most rural local authority in England. Here is the data.
. Graph of the full data for largely rural local authority districts. 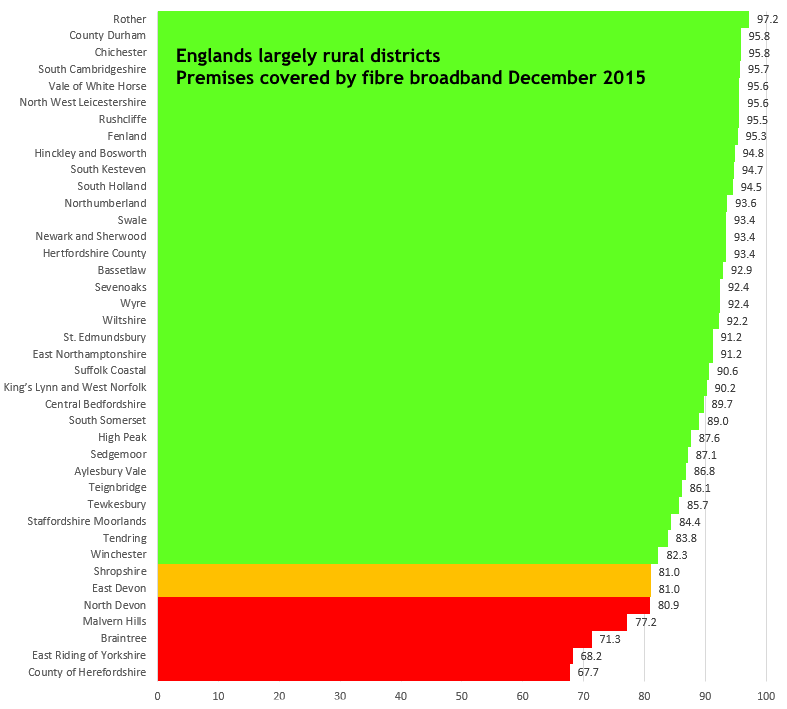 The average fibre broadband rollout for largely rural districts is 88.9%, compared to Shropshire at 81%.
. The ten local authorities that are most similar to Shropshire in statistical terms are, with broadband rollout in brackets: Wiltshire (92.2%); Somerset (85.9%); Suffolk (91.9%); Dorset (91.6%); Worcestershire (85.5%); Norfolk (83.8%); Lincolnshire (84.4%); Devon (71.7%); Gloucestershire (79.5%); Herefordshire (67.7%).
. Source: Office of National Statistics business demography. The number of businesses in Shropshire grew by 0.3% between 2009 and 2014 to 12,980.
. Rural districts have an average deployment of broadband to premises of 87.4%. For urban areas, deployment is 94.6%. Graph.